It was a lovely clear night on Saturday and I had the good fortune to be on the rota to open up the observatory for the evening. So wrapped up in several layers of thermals, fleece and hats, my fellow stargazers Alison, Stephen, Toby and I spent a very pleasant few hours gazing up at the night sky. I took along my binoculars and my camera, with the hope of getting a few shots of the heavens. Toby and Stephen had both brought along telescopes, while Alison operated the 12-inch telescope in the dome. We were soon joined by ten or twelve members of the public, as well as several of the astronomical society‘s members who had been attending another event down the road. Which all made for a rather convivial atmosphere, even if we were standing in a field. At night. In the freezing cold. As the sky got darker, the stars became more visible. 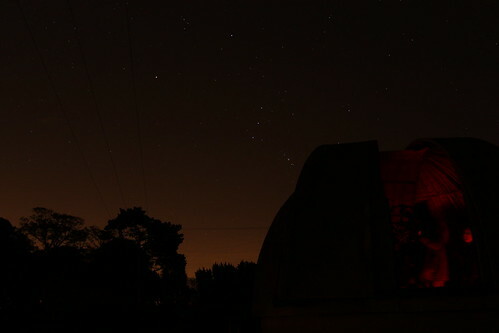 Here you can see Orion rising slowly above the dome. You can also just make out some of the activity in the dome itself. The dome is always popular among visitors, principally – I suspect – because it’s indoors and not quite as cold as standing around outside. Jupiter is visible at the moment and, even with just a few seconds of exposure on my camera, I was able to make out a couple of the planet’s principal moons. 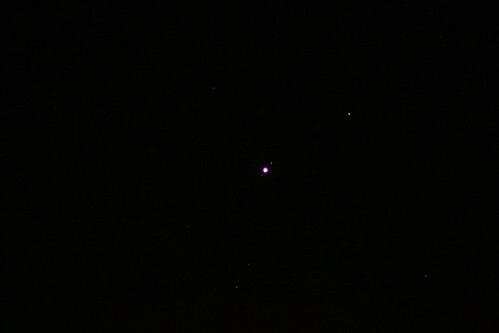 Jupiter is the bright dot in the photo below and the moons are the little dots to either side. 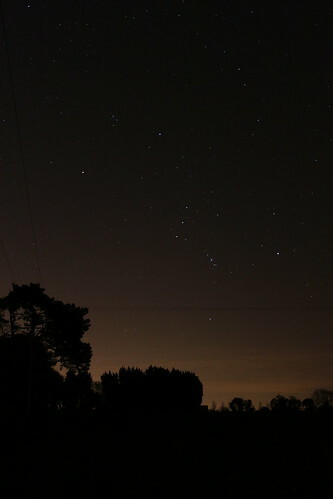 And here’s Orion in all its glory. This is my favourite constellation. As we get deeper into winter, Orion appears high in the southern sky in the late evening, just as I’m walking the dog around the garden before bed. It reminds me just how massive and permanent the universe is and puts into perspective any troubles or worries that I might have on any given evening. 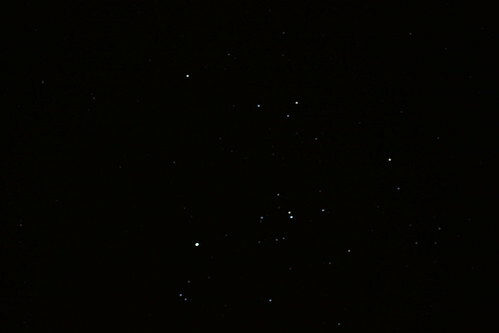 Here’s the Hyades star cluster, which looks very much like an arrow pointing to the right. The cluster is roughly spherical and is made up of hundreds of stars that share the same age, place of origin, chemical content, and motion through space. Cosmic co-travellers, if you will. 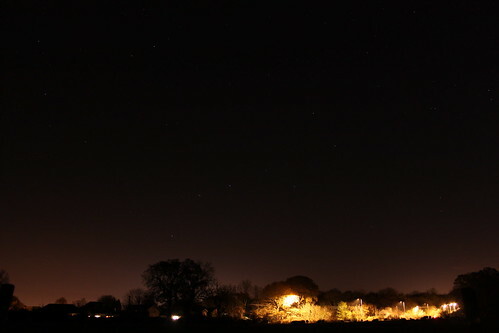 If you look carefully at the photo below, you can just make out Ursa Major, the Great Bear – or, rather, the bit of it that is more commonly known as the the big dipper, the plough or the saucepan. You’ll see also that the local council has kindly fitted downward-facing streetlights, to reduce light pollution near the observatory. While I’d been taking photos and chatting to people about the stars, I’d been vaguely aware of movement in the field next to the dome. When I looked carefully, I could just make out a sea of obscure black shapes. Were we being invaded by an enemy force? Aliens, perhaps, worried that we’d stumbled across something of intergalactic significance? Er, no. A muffled ‘baa’ confirmed that we weren’t under attack. 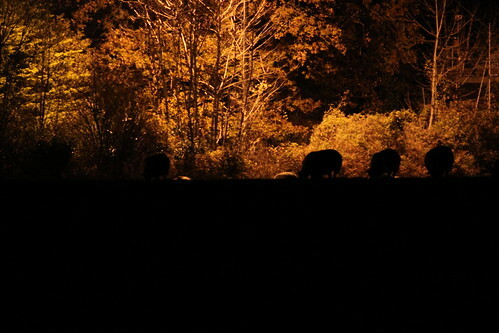 We were just surrounded by sheep, having a late night snack. This entry was posted in Astronomy and tagged Astronomy, Photography by Simon Perks. Bookmark the permalink. I’m surprised how well the stars came out in your photos! Me too… I always have to take quite a few to get things how I want them. It’s fun trying different apertures and shutter speeds, to get a decent shot. 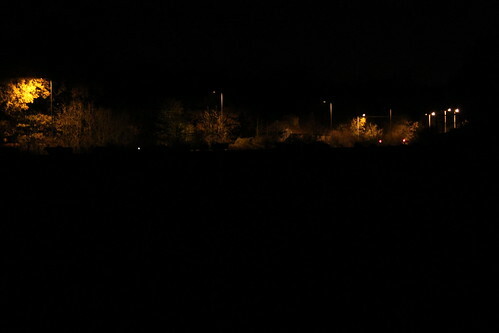 Though quite cold, too, given that I’m usually standing in a field, in winter, in the middle of the night!